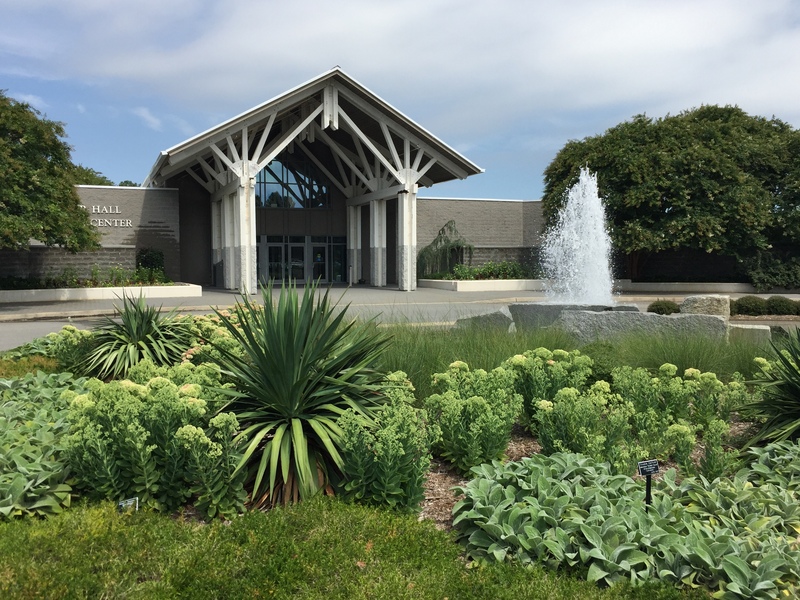 Anyone planning a trip to coastal Virginia or the Carolinas may want to include a half-day stop in Norfolk to visit the Norfolk Botanical Garden. It’s worth a special trip in any season. Nationally recognized, the garden spans 175 acres, has plant collections, themed mini-gardens, and other special features to delight and educate children and adults alike. In the 1930s, horticulturalist Frederic Heutte, supervisor of Norfolk’s City Parks, originally proposed planting an azalea garden in Hampton Roads. Norfolk gave City Manager Thomas P. Thompson 150 acres for a city garden featuring azaleas. In June 1938, the Works Progress Administration (WPA) awarded a grant for the labor and installation of the first plants, including 4,000 azaleas, 2,000 rhododendrons, and 100 bushels of daffodil bulbs. Using only hand tools and wheelbarrows, 200 African American women and 20 men toiled long hours through all types of weather from 1938 to 1942 to remove trees and their stumps, clear dense undergrowth, and build a levee for the surrounding lake. “Breaking Ground” a statue by Kathleen Farrell, honors these workers in the WPA Memorial Garden. WPA workers in the original Azalea Garden. Norfolk Public Library. “Breaking Ground,” a sculpture honoring workers in the WPA Memorial Garden. Norfolk Botanical Garden. Heutte became the first director of the garden. 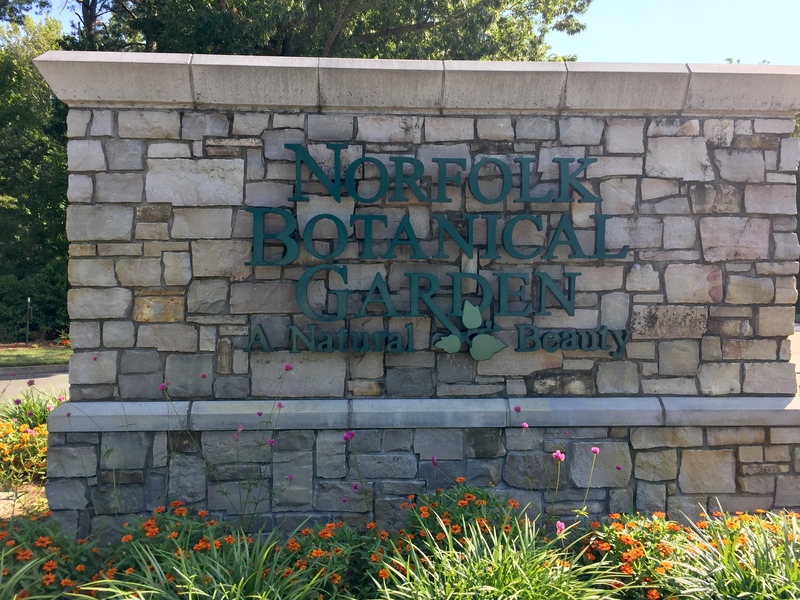 In time, the garden’s name changed from Azalea Garden to Norfolk Municipal Gardens and eventually to Norfolk Botanical Garden. As Norfolk is the North American headquarters of the North Atlantic Treaty Organization, the garden became the site of the annual International Azalea Festival that celebrates NATO member countries. Colorful planters decorate a bridge over the constructed waterway. NATO Tower can be seen in the distance. Photo © 2018 Elaine Mills. In 1958, the Old Dominion Horticultural Society assumed maintenance of the garden, and the next decades saw many improvements, including more variety in the plant collections; installation of pools, fountains and statuary; and construction of terraces, bridges, and waterways. With over 250,000 azaleas on the grounds today, the garden has one of the largest collections of the species on the East Coast. But it also offers the opportunity to see native plants and many exotic species in both formal beds and natural areas. Among the permanent plantings are six primary collections, several of which have been recognized by the North American Plant Collection Consortium. These consist of groupings of plants, such as a genus, for which the curators want to assemble a significant number of species and cultivars that can be grown successfully in the Hampton Roads region. In keeping with the original focus of the garden, plants of the genus Rhododendron – primarily azaleas — comprise the largest collection, with 558 species and cultivars. They are located throughout the garden with large concentrations in wooded areas such as the Enchanted Forest. The garden is proud to have the only accredited collection of Lagerstroemia (crapemyrtles) in North America. This tree was a favorite of director Heutte, who planted many specimens both in the garden and as street trees in Norfolk. There are 82 species and cultivars, mostly located in the Flowering Arboretum. The three remaining primary collections noted by Head Horticulturalist Les Parks focus on camellias, hydrangeas, and magnolias. Most specimens of the shrubs can be found in dedicated mini-gardens, while the native and Asian trees are primarily located in the Flowering Arboretum. Other notable collections include conifers, hollies, hostas, daylilies, daffodils, orchids, and viburnums. The garden also boasts 61 trees listed as Virginia state champions by the Virginia Big Tree Program, including a Quercus alba (white oak) which is the oldest tree in the garden. Stay tuned for Part II of our profile of the Norfolk Botanical Gardens! The Visitors Center has a gift shop and facilities for classes and conferences. Photo © 2018 Elaine Mills. Open April 1-Oct 15: 9 a.m.-7 p.m.
Beginning October 16: 9 a.m.-5 p.m. 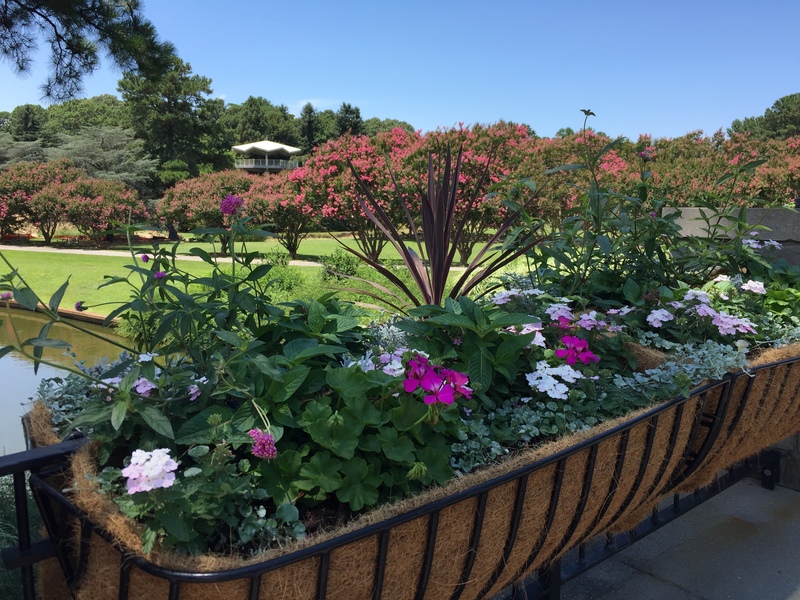 The Norfolk Botanical Garden is proud to offer multiple options for viewing the grounds. The tram, free with garden admission, is a good way to get an overview. It departs the Visitors Center hourly on weekdays and every half hour on weekends, with seven scheduled stops on each 25-minute tour. Ticketed boat tours of 45 minutes depart the boat basin four times a day, traveling through the garden via a canal to the surrounding Lake Whitehurst. There are 7 miles of paved and 7 miles of unpaved paths to explore on foot. The garden also has a café, a gift shop, and a horticultural library. Events at the garden include dog days, bike nights, sunset cruises and kayaking, as well as art and craft classes and programs on such topics as sustainable landscaping, beekeeping, and garden design. 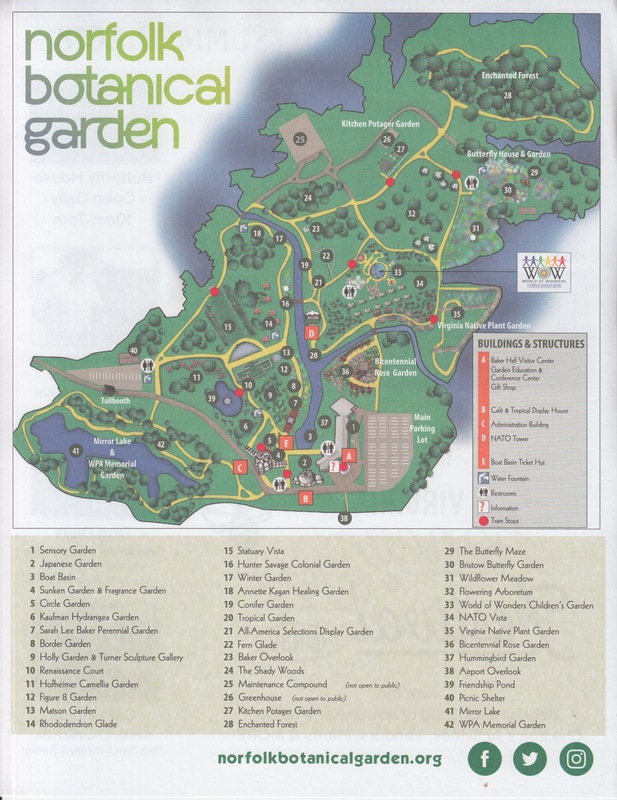 The garden’s web site includes a garden map, descriptions of the collections and mini-gardens, a calendar, bloom charts, and an online plant database. This entry was posted in MG in the Garden, Regional Gardens and tagged Botanical Gardens, Norfolk Botanical Gardens, Regional Gardenes. Bookmark the permalink.